and his brother Sanatana Gosvami were living separately in Vrndavana and going on with their bhajana, devotional service. Rupa was living in the forest, and there was no facility for cooking nice food or begging from the village for a capati to eat. Rupa Gosvami was the younger brother, and he thought, 'If I could get some foodstuffs, then I could prepare nice dishes and offer them to Krishna and invite my elder brother." He had that desire. The next moment, a nice girl about twelve years old came and delivered an abundance of foodstuffs -- milk, flour, ghee, etc. That is the Vedic system; sometimes householders present foodstuffs to mendicants and sages in the renounced order of life. Rupa Gosvami was very glad that Krishna had sent so many things and that he could now prepare a feast. He prepared a feast and then invited his elder brother. "Then Sanatana said, 'This nice girl is Radharani. 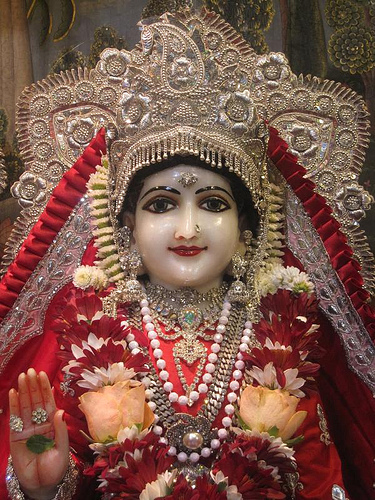 You have taken service from Radharani, the Lord's eternal consort. It is a great blunder.' That is their philosophy. They would not accept service from the Lord. They simply wanted to render service. But Krishna is so clever that He also wants to serve His devotee. He looks for an opportunity to serve His devotee. This is spiritual competition. A pure devotee does not want anything from Krishna; he simply wants to serve Him. And Krishna also looks for the opportunity to serve His devotee. Krishna is always as anxious to please His devotee as the devotee is to please Him."